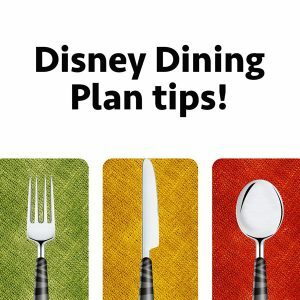 Deciding whether or not to get the Disney Dining Plan isn't as easy to figure out as it used to be, but today I have some Disney Dining Plan tips to help you decide and help you to maximize your dining plan credits during your trip. I also have a quick tip just in case somebody gets sick during your Disney World trip. How much does it cost and how many credits are included? Who should get a Disney Dining Plan? WDW Prep To Go episodes are now on YouTube! Watch this episode at https://www.youtube.com/watch?v=MG8EbWRcusg and be sure to hit subscribe. Table Service - entree and beverage. Lunch and dinner also include dessert. Character meals and dining packages are generally a great use of a Table Service credit. Signature Restaurants are almost never a good credit value. Go for the steak, lobster, shakes, and orange juice. Split credits when portions are large. Choose snacks that cost $5 or more. When searching for DDP restaurants, don't filter for the next year. Instead, filter for restaurants for the current year since many restaurants are slow to be added. The My Disney Experience app will now allow you to track credits during your trip. "We just returned from a Disney World trip. I, unfortunately, came down with a super bad stomach bug halfway through. After 2.5 really unpleasant days, we finally called our trip insurance for help. They connected us with DOCS - Doctors On Call Service. The doctor came to our resort room, brought his entire exam room with him in a rolling office suitcase, and dispended medication I needed to feel better all right there on the spot. He also had a pharmacy on standby that delivered additional medication to the front desk of our hotel and charged it to our room. If we'd known about this service sooner, we wouldn't have missed some park touring days. I'm still really glad we called. You pay cash for the service, but they give you all the paperwork you need to file with your insurance afterward. And we had trips insurance that will be primary on the medical, so it will be 100% covered. We also spoke to the front desk concierge staff at our All-Star Sports Resort about missing some park days, and they gave us additional park tickets in our My Disney Experience account to come back and use anytime in the next 5 years." I really like your tip about choosing snacks that cost $5 or more to maximize credit. My daughter’s preschool is planning a trip to Disneyland, and she’s really stoked about it! This tip will definitely help us enjoy our time in the theme park.